Creative, cool owl-race with solar feathers? Heck yeah! We begin this supplement with a nice int5roduction to the race and its most prominent members in the Xa-Osoro system (one of which erroneously calls them “saursi”, as a purely aesthetic nitpick), before we begin with the physical description. Cool: The xaursi are differentiated between 2 subspecies – the diurnal xal and the nocturnal oso (which is btw. also noted in the abbreviated NPC-reference), who are, in a nice linguistic touch, obviously named after the binary stars of the system. Xal have brilliantly-white plumage, while oso have darker plumage. Note that parentage doesn’t provide an indicator of which subspecies the offspring will be, which resulted in the belief that the twin-stars’ patronage is what determines the xaursi’s plumage. The speckled plumage of these folks can store solar energy, dancing across them like scintillating lasers. The xaursi’s homeworld has been destroyed by the cataclysmic Regicide, and nowadays, the orphaned race, always focusing on a dualistic and holistic approach, has been tinted with twangs of sadness and loss. The write-up paints a diverse and concise picture here. As always, the only thing not included in the write-up would be the “Playing as a xaursi..:”-section of roleplaying advice. On a plus-side, the xaursi do get their own subtype graft, which is awesome, but misses two (very minor) things – a closed bracket after flight maneuverability, and the notice that the fly speed granted should be extraordinary. Then again, the latter can be deduced from consulting the xaursi’s proper racial write-up. 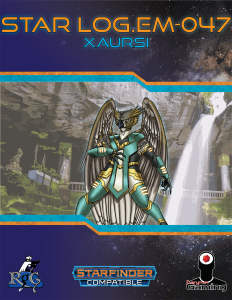 Speaking of which: Xaursi are Small and have a 20 ft. base speed and 30 ft. extraordinary flight with average maneuverability. As a balancing tool, until 5th level, their flight needs to end on solid ground each turn. Kudos. Xaursi have 2 Hit Points, and all get +2 Dexterity and -2 Constitution; xal get +2 Charisma, while oso get +2 Wisdom. Their unique feathers can create a variety of effects via faerie feathers as a move action. They can shed light in a 10 ft.-radius; get +2 to Bluff made to feint, Disguise to change appearance or Stealth made to hide; +2 to dirty tricks made to blind targets or resistance 2 versus a single energy type, chosen from fire or electricity. Only one of these effects may be in effect; dismissing the effect or changing it, is as well a move action. The race also gets low-light vision, natural attacks and a +2 racial bonus on saves vs. darkness, light and shadow effects. The pdf includes a new feat that allows a xaursi to have two feather effects in effect at a given time. Editing and formatting are very good on a rules language level, and almost as good on a formal level. Layout adheres to the series’ two-column full-color standard, and the artwork by Jacob Blackmon of the xaursi is neat. The pdf has no bookmarks, but needs none at this length. This is the first file by Hilary Murphy Moon that I’ve analyzed, and it is a really pleasant surprise. The xaursi are not just another bland bird-race – they have an interesting angle on the fluff side;and on the rules-side, their plumage-based abilities are creative, and from balance regarding flight to the bonus-typing, the race is creative, precise and fun. I know that the plumage component warrants further expansion – I’d really like to see more from these owl-folk! All in all, definitely a race worth recommending at a final verdict of 4.5 stars, rounded up for the purpose of this platform. Great job for a freshman offering indeed! You can get this cool and evocative race here on OBS!